What should I do if I use multiple SIM cards for my US and international numbers? If you already have your US number registered, but you will need to use your international number to authenticate while abroad, make sure you add your international number before leaving the country. 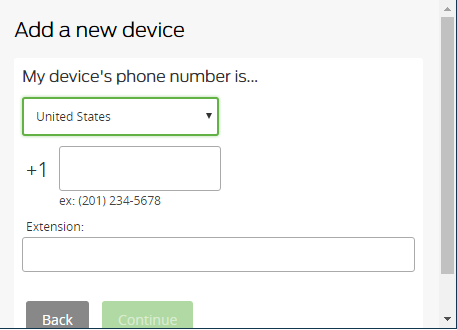 If you are no longer able to access your US number, and you need to access Duo using your international number, contact the help desk to assist you in adding a secondary device. Note: You will need to have a supervisor / faculty member confirm that you have a business justification for using Duo before the help desk can add a second phone number to your account. Can I install Duo Mobile on a device running iOS 4.3 (or lower)? The minimum supported operating system version for Duo Mobile 3.1.0 and above is iOS 6.0. Users installing Duo Mobile for the first time with devices running pre-iOS 6.0 need to download Duo Mobile from the App Store using the iTunes application on a Mac or PC computer. You must be signed in with the same iTunes account you plan to use with your phone. When the download is complete, open the App Store on your pre-iOS 6.0 device, and install Duo Mobile. You will be prompted with an alert informing you will receive the latest compatible version of Duo Mobile (v3.0.2). I lost/broke my phone OR have a new phone number. How can I add a new device? Please see Adding a Device to Your Account for details on how you may add a new device. Why do I have to use Duo? Over the past few years, we’ve seen phishing and identity theft crimes increase in the higher education sector. At universities that were hit first, some employees who have been taken in by phishing emails have even had their pay checks rerouted away from their bank account to accounts controlled by cybercriminals. Word spread quickly among higher ed security experts, and by being aware and knowing what to look for we have so far been able to prevent similar results at Ohio State. The Duo system is one of many steps taken to assist in securing your information. Can I use my computer to receive a call back? If you have Skype Voice (also called Enterprise Skype Voice) and normally attend Skype (Lync) meetings with audio through your computer, then you should be able to receive your Duo call back through Skype as well. If you attempt to receive the call back through Skype and cannot complete the call then you may not have voice on your account. Call the IT Service Desk to find out more! If I install the mobile application on my device, can the university monitor or gain access to my personal information? Can the university wipe my device? Adding the mobile application to your personal device does not enable any monitoring or access to personal information. The mobile application does not have any functionality enabling the university to wipe your device. 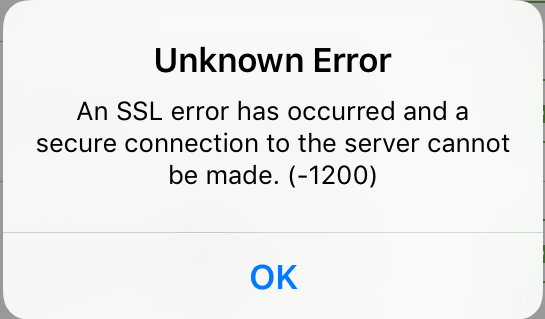 When I try to use Duo I receive the following message on my device. What happened? Going to https://linktohealth.osu.edu and authenticating. 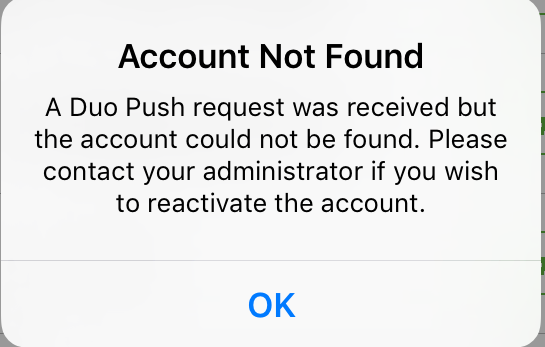 Click on "Reactivate Duo Mobile"
If needed, please contact the OSU Health Plan at (614) 292-4700 for further assistance.. When I try to use Duo to "Send me a Push" I receive the following message on my device. What happened? Check your WiFi settings and ensure you are properly connected to a wireless network or you are using your cellular network if WiFi is not available. With WiFi@OSU, it is necessary to open a browser (i.e. Safari) on your device and connect as a guest or to the secure network. If you have not connected through the browser your device may appear to be using wireless but has not fully established the connection. This message is not caused by an issue with Duo but indicates your device is not properly connected to a network. Can I use an international number? Yes, Duo will support international phone numbers. When adding a new device just be certain to change the country to match the origin of the number.